Quakers have today signed striker Scott Fenwick, and he will be included in the squad for the game at Salford on Saturday. Scott has played in several of Quakers' pre season games, the latest of which was the 0-0 draw at Guiseley last Saturday. 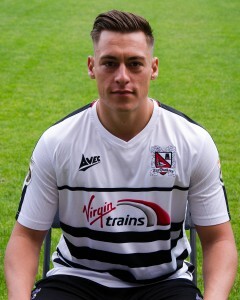 He also scored Quakers' goal in the home friendly defeat by Newcastle United last month. He played in the academies at Middlesbrough, Sunderland and Newcastle before in turn joining Northern League clubs Newcastle Benfield, Durham City and Dunston UTS. He joined Hartlepool United in the 2014-15 season and helped them avoid relegation from the Football League that season, and in total made 42 appearances for them with a loan spell at Tranmere in between, before joining National League York City in the summer of 2016. He made 24 appearances for York and left them this summer. We would like to wish Scott the best of luck during his stay with us.